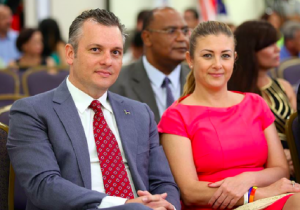 WILLEMSTAD - The Public Prosecutor‟s Office (OM) Curaçao will proceed with the process to reclaim funds from Gerrit Schotte (Curaçao, 1974) and Cicely van der Dijs (Curaçao, 1978). It concerns the recovery of funds in the “Babelinvestigation” were according to the OM, Schotte and Van der Dijs have unlawfully obtained illegally financial benefit. The Common Court of Justice issued a judgment on 21 July 2017 in the "Babel" case. Schotte was convicted for, among other things, accepting more than USD 200,000 in bribes. Schotte and Van der Dijs were both convicted for the joint laundering of these bribe. Penalties were imposed of respectively 3 years and in the case of Van der Dijs 15 months, of which 6 months were conditional. In addition to the prison sentence mentioned above, Schotte has been dismissed by the Court as an additional punishment for a period of five years from the right to be elected during the elections. In the case against Schotte, the Public Prosecutor will reclaim an amount of 1,861,692 guilder thru the Court of First Instance in Curaçao. This amount includes a payment of more than USD 800,000 that, according to the Public Prosecutor‟s Office, was made to Schotte in the Swiss bank account of a company based on the Marshall Islands were Schotte was the beneficiary. In the case against Van der Dijs, the Public Prosecutor will demand an amount of 205,274 guilder. This is the amount that according to the Public Prosecutor has benefited Van der Dijs personally in this case. The cases will be dealt with on 15 February 2018 during a so-called “regiezitting”. Defense will have the possibility to file for additional investigation.